The twenty-first edition of the Forum of Private Business Health and Safety guide will be available for our members from 11th April 2018. It is a vital business resource for any business owner not only our members and it will give you peace of mind to know that you will be fully up to speed and compliant when it comes to managing your legal health and safety obligations. Our guide is a simple and easy to use checklist format that will help to identify where you are already legally compliant and it will point out where you may not be compliant. Up to date information on all current legislation and step by step guidance is available within the guide to ensure that you can demonstrate your management arrangements for Health and Safety to the HSE, local authorities, clients, insurance companies, solicitors and more, as well as working and providing a safe environment for employees and customers. 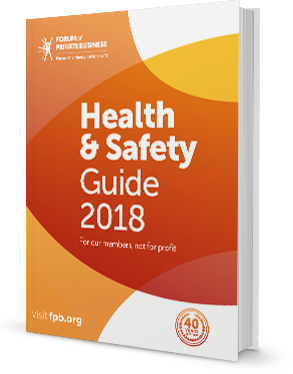 Our Health and Safety Guide 2018, one of the most important guides for a business, forming part of the Forum’s comprehensive support package to help members comply with legislation. Find out about other guides that the Forum has available. The UK has a health and safety record that is the envy of many countries across the world, but in order for this to continue, we need to protect people and manage the risk factors that can arise. Managing workplace risks should not be complicated or expensive, and the Forum of Private Business has solid business support and advice as well as insurance protection for businesses. A health and safety policy is really simple and easy to understand and to implement. If you would like to know how you can obtain a copy of our latest Health and Safety Guide or how to become a member can benefit your business visit you can call our membership advisors on 01565 626001.